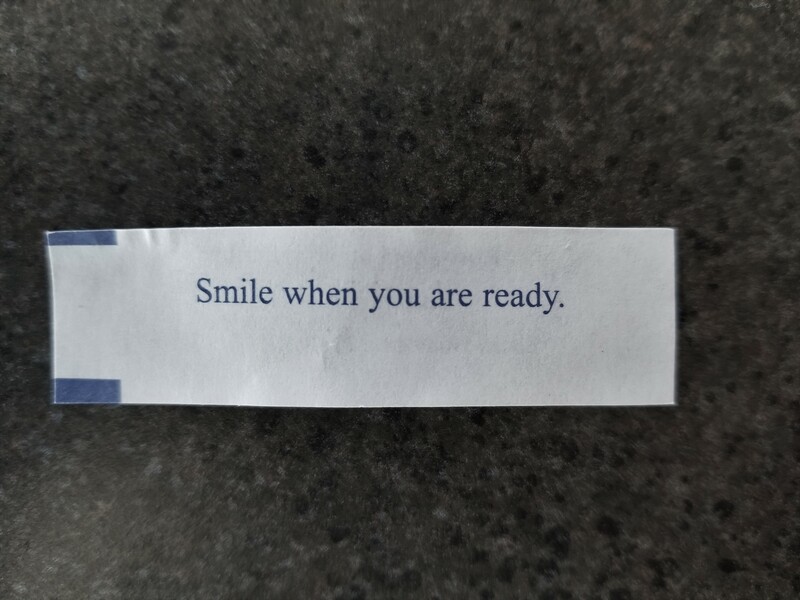 The other day I opened a fortune cookie, the fortune read: “Smile when you are ready.” I sat dumbfounded, staring at the tiny strip of paper that felt so heavy in my hand. The irony wasn’t lost on me, not at all. Can a fortune cookie carry such a profound and seemingly calculated message, or could this be a cosmic joke from the universe? Two years ago, my younger sister and only sibling died by suicide. Suicide has touched me. No, let me rephrase that, suicide has raked its claws across me, dug in, and refused to let go. I’m now what is commonly referred to as a “survivor of suicide.” Meaning, someone in my life attempted suicide and did not survive it. The survivors are those still here. We are the collateral damage. I have not been okay since she left and like all survivors of suicide, my life is forever changed. A part of me didn’t survive when she left, a part of me suffers over and over again each day without her. For my sister, the pain has seemingly stopped. For me, it hasn’t. According to research, as a survivor of suicide, I’m now in a high-risk category for suicide myself. I will admit, I walk the line between wanting to end my own agony, but I don’t have the luxury of not realizing how this will heavily impact the people in my life. I know exactly how it will tear them apart. It will prey on their minds, many sleepless nights and bouts of hot, random tears triggered by a commercial on TV or another girl who resembles me in line at the grocery store. I can’t do it. I can’t because I see it from the perspective of someone still here. And that place is a unique, complex kind of hell. Holidays and birthdays are hard. Average Tuesdays in February can be hard. Seeing people I know hanging out with their sister on the weekends—also hard. At this point, reality has set in: I will never help her shop for a wedding dress. We’ll never go hiking in New Zealand together. Instead, I have complicated grief topped off with a touch of PTSD. Maybe to you, I might seem angry at my sister for putting me in this position, but I could never be angry with her. She didn’t know. She couldn’t know. It is because of her, all the good that she embodied, that I’ve made a commitment to stay because she could not. I will try new things like pottery and goat yoga because she would want me to. I will knit scarves for people because she used to lovingly tease me about my obsession with staying warm in the winter. I will tend my roses and pull the weeds around her final resting spot. I will go to therapy and I will heal. For us. There’s still a lot of fight left in me, and I will use it to spread the word: someone, somewhere out there, loves you. If you can’t think of someone, I’d ask you to look again. Reach your hand out and see who grabs it, because someone needs you. Your future self needs you. You have a voice and it matters. Your presence affects people, your perception helps them in ways you might not even realize. And there will never be another smile like yours. There’s a fortune cookie out there with a weird and cryptic message that was made just for you. If you haven’t found your fortune cookie yet, I’ll share mine. And if we don’t feel like smiling right now, that’s okay. The simple message gives us permission to feel our feelings. It almost seems to understand that we’re on a difficult journey, and sometimes it’s dark. The path is winding and we carry overstuffed loads strapped to our backs. 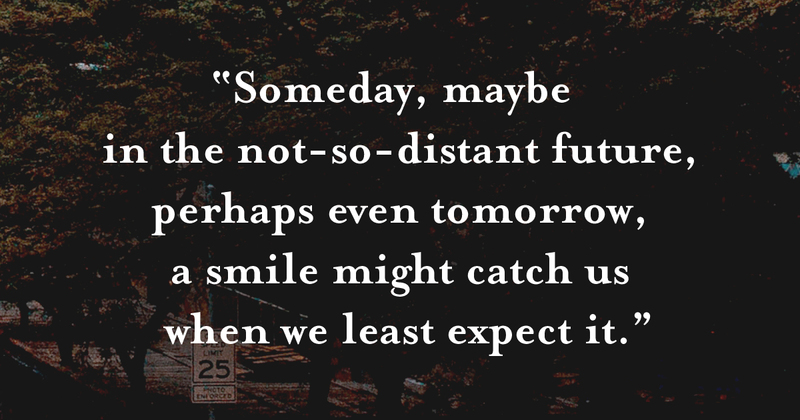 But it’s also a gentle reminder that someday, maybe in the not-so-distant future, perhaps even tomorrow, a smile might catch us when we least expect it. I’m so so sorry about what happened but this story I can’t even explain how this makes me feel but I love it. I am also a survivor of suicide, but it is me who survived (barely) my own suicide attempt a few years ago. While i certainly respect the position of the author here and no cannot imagine her pain though i have lost many to suicide, it is not true that all of us just need to reach out our hand and someone will remind us they are glad we survived. Because NO ONE came running for me when i survived. In fact, the entire episode was completely ignored. I have been brutally abused for years starting in infancy and my decision came w great forsight. Yet no one suddenly reached back towards me in those times i outstretched my hand hoping to make a different choice and no one reached in to tell me my death would matter. So no, that experience is NOT true for all of us, and it is the assumption that it is and thus we are selfish or somehow blind to those who might be hurt by our death that perpetuates the shaming around people who choose suicide as a carefully thought out and right for us decision. Because there is one person suffering from my failure to complete suicide, and that is me. And the only hand reaching in or out is my own. Thank you so much for commenting and sharing part of your experience with us. We are grateful for your transparency and willingness to talk about it. Your feelings are valid, please know that, as are the author’s. We believe no two stories are the same and that is why we find it so important to share these stories. Although you feel that no one reached out for you during that time, we hope you know that there are people who exist in this world that want to help you, especially in these moments of struggle. It may not be a loved one or a friend, but there are people on this team, volunteers who work for our friends at Crisis Text Line, and folks from other resource options that would be grateful to help you get connected to professional support. We truly do want you to know that you are not alone in this. You are loved and appreciated more than you know. We are glad you’re here, and are sharing your courage to speak up with us. Would you email us at info@twloha.com and tell us more about yourself and your struggles? We would be honored to provide you with some options for support. you are not alone. I live with suicidal ideation but deep down know my story isnt over. I have seen and felt the devastation that families and friends go through when a loved ones pain is so overbearing that they think of nothing else but stopping that agony. Thank you for sharing your story. Sarah, I remember reading a previous article of yours about your sister and how deeply that one touched me. This one has once again done the same. You have a beautiful, eloquent way of expressing your feelings and I appreciate your genuine spirit. I admire your perseverance and how you have used your loss to encourage others. I am truly inspired by your words. I didn’t face the same type of loss but a heartbreaking loss nonetheless, and I know how hard it is to overcome it. And while I thought my world had shattered, I am finally starting to find reasons to smile. Life can be so bittersweet, but in the heartache, there IS healing! Thank you. Hi Sarah. Your words touched me so much. I’ve lost my brother 3 months ago. I was afraid he would commit suicide but he just died, like that, during the night. Since then, I feel empty, alone and desperate, having dark thoughts too. But like you, I think about the people still there that love me, I think about me, what he would tell me to do “go on sister, you still have wonderful adventures to live”. So I stay. Thanks Sarah and take care of yourself. I appreciate your comment. I read a statistic recently that stated that the suicide of one person directly impacts at least 6 others in their life. (I think it’s probably much higher) The shockwaves of a suicide are vast and far-reaching, as you unfortunately understand. Take care. You are loved. anyone, I’m humbled if I have. Simply writing about my sadness has been therapeutic in so many ways. I’d encourage anyone who has experienced a devastating loss to write it out – or if writing’s not your thing, draw/paint it out, sing it out, run it out, whatever you have to do. Healing happens in tiny baby steps. Sending love and light for your journey. having lost a sibling to suicide I can relate. Although at the same time I myself was on the verge of suicide. Actually that same weekend. He was my step-brother, but I referred to him as a brother. He lived over 1200 miles away and I neither of us knew about the others suffering. Now I have to live with the fact that suicide took him. I am trying… Some days are better than others. I am really struggling at the moment, constant thoughts of suicide, black cloud over my head. So to read this meant alot. We’re so glad that reading Sarah’s words could help you in some way. We want you to know that you are not alone in how you are feeling. Would you email us at info@twloha.com so we can learn more about your story and offer you some encouragement and support? You can also reach out to Crisis Text Line by texting TWLOHA to 741741. It’s free and available 24/7. Please know that you are worthy of help and we truly believe things can get better. I believe siblings have a special bond that can never be broken. I’m sure that your brother would want you to stay and the fact that you know exactly what he would say to you is just further proof of the enduring bond of siblings. Thanks for your comment. You are not alone. Thank you for your story. I recently lost my sister to suicide and though wound is fresh and feels as though it cannot be healed, your story gives me new hope. I am in tears and have no words to describe how this hit me. Thank you for writing it. I’m so sorry about your sister. Your writing is superb. Much love to you. Thank you. Today I cannot smile. I can only cry. But that’s ok, it will get better. I appreciate your comment and I also appreciate that you shared your struggles. Life is certainly not easy at times, and candy-coating the reality of suicide helps no one. I would like to address a point that you made in your comment that I didn’t cover in the above piece. Despite having been through a tragic loss to suicide, I personally would never, ever perpetuate the stigma that those to choose to die by suicide are selfish or “blind.” Even though I wish my sister would not have chosen this, I fully recognize that it’s not my decision to make, and we live in a free-will existence. I know that her suicide was not about me. Her heartbreaking choice has hurt me and changed my life but I respect it, because I respect her. I’m sorry that you feel you were shamed by people in your life after your attempt. That stigma is unequivocally wrong and I hope by opening a dialog about suicide as a national epidemic, society can begin to leave these archaic beliefs behind. It’s time to move beyond assumptions are start having real conversations. My hand reaches for yours. TWLOHA has my email address which I’d give them permission to pass on to you if you don’t believe me. Wishing you peace, in whatever way that resonates for you. Please accept my sincere condolences for the loss of your sister. Try to care of yourself as much as you can right now. Even just the basics if that’s all you can do as you clear away the rubble. I’m thinking of you. My deepest sympathy for the loss of your brother. I can somewhat relate because my sister and I lived on opposite ends of the country, so there’s a feeling like the distance was somehow a factor in her leaving. And I agree, some days are better than others. Dang. It wasn’t my sister, it was my very best friend. However, I feel like you took everything I’ve ever thought about his death and put it out there for all the world to read. Thanks for clearing my head for me. (I think.) “Suicide Survivor” is not a club I’d wish on anyone else and you are spot on when you state that it is just this thought that keeps me here fighting the good (yet sometimes ugly) fight called life or as some phrase- the “new normal.” Anyhow- appreciate your words more than you know.